Which Two Spindle Drill is for You: The FMM-2 or the FMMP-2? The Lassco Wiezer floor standing two spindle drills come in two different models, the FMM-2 Two Spindle Drill and the FMMP-2 Two Spindle Drill. Both machines offer fast and efficient drilling, however, there is one major difference between them. The FMM-2 Two Spindle Drill is one of the most economical heavy duty floor standing two spindle drill on the market today. The FMM-2 offers up to a 2 inch deep drilling capacity, with easy movable drilling heads and a traversing table which makes drilling large stacks of paper fast and simple. The machine also offers a rugged mechanical lift table that smoothly traverses in either direction with a manual foot petal for a hands free operation and gives you full control over the drilling speed of the unit. 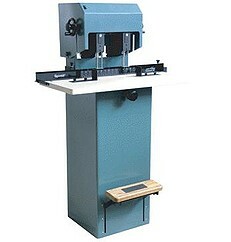 This machine drills two holes in files and records the use of the two hole fasteners, the distance between spindles, and has the ability to adjust from 2-3/8” to 10” on center. This paper drill is ideally suited for large hospitals, accounting offices and casinos because it makes drilling large stacks of paper fast and simple. The FMMP-2 Two Spindle Drill offers all of the same features of the FMM-2 with the added convenience of a foot petal activated pneumatic powered table, which can be powered by your in-house air or with a compact compressor. The FMMP-2 is built for ease of use with its 2 inch drilling depth with stationary heads set at 4-1/4” on the center for three-ring binder drilling. The machine drills two holes in files and records the use of the two hole fasteners, and the distance between spindles is also adjustable from 2-3/8” to 10” on center, and the traversing table can travel up to 14 inches. Both the FMM-2 and the FMMP-2 comes with an accessory package which includes: a drill sharpener, Spin-Eze drill bit lubricant, 5/16” drill bits and chip cleaner. If you have any questions or are interested in the FMM-2 and FMMP-2 Double Spindle Paper Drills, visit us at SpiralBinding.com. We have great pricing on a full line of Floor Standing Drills. Call us at 1-800-631-3572 for more information!